Google is said to be wheeling and dealing with IBM and German auto parts maker Continental AG so that you have to do not a thing behind the wheel of a self-driving car in the future. The technology and auto companies are reportedly readying an announcement about their pact in time for the Frankfurt Motor Show, according to The Daily Frankfurter Allgemeine Zeitung, which you may have guessed is a German newspaper. Since the 65th International Motor Show starts on Sept. 12, we could be less than a month away from hearing which direction the trio plans to take the idea of autonomous driving systems. Continental is already carpooling with another top U.S. technology company, Cisco Systems, in an effort to bring driverless cars to the road, according to Reuters. 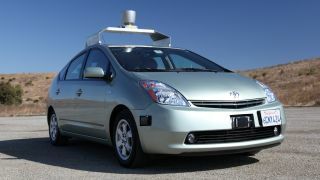 Google's driverless car of the future may seat four major companies in the end. Google has been testing an ambitious self-driving car project on the open road for the past three years, having driven (or not driven) a modified Toyota Prius from Mountain View to Santa Monica, Calif., and it could have something to show for it in the next decade. Continental AG, meanwhile, is a key manufacturer of tires, braking systems, vehicle stability control systems and other automotive parts. As the fourth largest tire manufacturer in the world, it certainly has a foothold in the car industry. That's exactly what Google needs. While Google has captured worldwide attention with its self-driving car project, the company may have to deal with rivals like Ford, Toyota, GM and Volkswagen, which are said to be working on similar projects of their own. Read about another way to get around: The Hyperloop.